The Chicago Shakespeare Theater was kind enough to provide complimentary tickets for me to bring my family to the opening day of Shakespeare’s Comedy of Errors. While I usually dread going to Navy Pier because of the steep parking tab, I jumped at the opportunity to introduce Eva, age 7, and Charlie, age 4, to Shakespeare. Even though I have a degree in English Education and therefore have studied and taught Shakespeare, I could not recall this particular play. No matter, the synopsis is provided in the program. Just before the performance was to begin, I read and explained the story to Eva. When she responded with a, “huh?” I became worried and told myself that since it was a mere 75 minutes long, it would not matter so much if she understood it. As for Charlie, I just prayed he would be able to sit still and behave. As soon as the performance began, the laughs came simultaneously and my anxiety quickly disappeared. 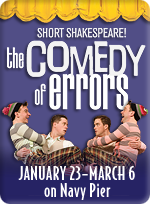 This play had it all — slapstick physical comedy, romance, jugglers, cross-dressing, and drama. Yes, I did have to lean over to Eva a couple of times to explain, “You see, she thinks he is her wife, but he is really the wife’s husband’s twin brother, ” and, “No, the two servants have the same name and they look alike.” She really seemed to get the hilarity surrounding confusing the lookalikes. As for Charlie, my four-year-old, I don’t think he understood one bit of the story, but he enjoyed it on his own level nevertheless. He laughed at all the right times. When I asked him to tell me his favorite part, he exclaimed, “All of it!” As for Eva, she liked the mustached man dressed up as the wife of one of the twin brother servants (Strangely, this was my husband’s favorite part as well). As befitting a children’s performance, the lights go up after the show and the audience is encouraged to ask the cast members any questions they may have. Following that, the cast members mingle with the audience in the lobby. I was especially amazed that the children did not complain about the Shakespearean language. Before the show officially began, one of the actors wisely “warned” the audience that the language would seem difficult at first but to give it a chance and rely on the context instead of getting hung up on understanding every little word. During our lunch following the show, I asked the children whether they had trouble understanding what the actors were saying. They looked at me curiously and answered with a resounding, “No!” I’m so happy that this was their first experience with Shakespeare. They had fun! When I told them that William Shakespeare was one of the greatest storytellers of all time, I think they really believed me. Try telling that to a group of high schoolers faced with reading the stuff and you get a room full of eye rolls. Oh, and as for that supposedly steep parking tab, the theater validates and it only came to $14.40. Thank you Chicago Shakespeare Theater! I remember volunteering at a charter school in Pilson and one of my duties was to stand outside to usher the teenagers in so that there was no loitering outside the school. “Loitering makes them targets for drivebys,” I was told. Believe me, my heart beat a little faster every time a car drove by during that half hour. I can’t imagine what these children go through every day walking around the neighborhood. The very fact that people (Daley especially) were “shocked” that we didn’t get the Olympics proves that most people, while they are quick to say, “Oh isn’t that a shame about all those young people dying?” Really don’t understand the severity of the problem. Of course we didn’t get the Olympics! While to the naked eye from all the cool tourist spots like Millenium Park, the Museum Campus, and Oak Street Beach, we look like the perfect city on the lake, we simply can’t hide the ugly truth about our children any longer. Generations have been and are growing up without parental involvement. We can’t put all the blame on the teachers, as those in the past like Valis and Duncan liked to do. We can’t rally the parents, because they are too busy struggling with addiction, poverty, lack of health care and gangs to pay attention to whether their young one has clean underwear or has a bedtime story to read. However, we can’t throw up our hands and give up! Something drastic and radical has to be done. If it means year round schooling with longer school days just so we can give the kids a few hours of supervised play on a playground, a place to do laundry and a decent dinner before sending them home to bed, then it has got to be done. Maybe we need boarding schools? If the parents won’t parent, then we’ll have to do it. Of course all of this would be very expensive, but if we don’t pay for it now, believe me, we’ll all pay for it later. The whole family went to a baseball game out in Schaumburg, Illinois. Read about our wonderful time and why it doesn’t matter whether you are a Sox or a Cubs fan, and why you should take your family to a Flyers game at Chicago Moms Blog here. Gadget Man has been off of work this week on vacation and since Eva started second grade on Wednesday, we decided to take Charlie on a family of three outing to the Shedd Aquarium in the big city. We were happily surprised to find a “dress rehearsal” of Fantasea, their new dolphin show which is so much more than a dolphin show now. Gone are the “don’t litter” lectures and the endless blabbing on of the marine biologists. What they have done is quite magical. Gadget Man and I speculated someone consulted Disney for this new show. Costumes, lights, a boat which flies across the pool and umbrella toting divers dressed in dolphin outfits appear a la Mary Poppins style and drop into the water unexpectedly. The belugas, hawks and penguins join the dolphins for this spectacular show. The only downer was a special pre-show film narrated by Bill Kurtis of how they had to fly the belugas to Connecticut for nine months while the the Shedd was renovated. I can’t believe they couldn’t find or build something suitable and it was better to fly the whales on a plane! I guess I’ve been watching too much Whale Wars and I’ve really come to love those guys. When Fantasea officially comes out go see it!!! Chicago Moms Blog Brunch Was Yummy! Thank you to Cindy Fey and Kim Moldofsky for organizing our awesome Chicago Moms Blog brunch two weeks ago. The location, a luxurious party room in a posh downtown building, was perfect. The locally donated food sublime. We had delicious cheese and nut selections from Pastoral Artisan (check them out for their cheese-making classes). The pickled veggies and old-fashioned jams from the Jane Addams Hull House were colorful and yummy, and the Eli’s Cheesecakes simply decadent! Thank to all those companies who donated! A special thank you to Virginia Montgomery, a massage therapist with magic hands (and, as you can see on her website, quite a unique location for a massage)! Also, it was such a great idea to have all the guests bring books for donations to Bookworm Angels, a worthy cause indeed! Oh, and by the way, I just loved listening to my fellow bloggers read some of their posts and poems. I am humbled to be a part of such a talented group! I can’t wait to see you all again at our Blogher pre-party! I guess I should preface this by saying I have been a big fan of Jeremy Piven. Although he has made some terrible terrible choices in movies (PC U is one of them), his talent has always shined through. He makes that show Entourage. Gadget Man and I are constantly rewinding his one liners so we can see him perform them again. Anyway, he has gotten a ton of flack b/c he dropped out of his Broadway show due to mercury poisoning. Apparently, he used to eat sushi every day. Anyway, his producers didn’t believe him and are pursuing it through arbitration with the actors union. Mercury poisoning from fish is well-documented. Pregnant and nursing women, as well as children have been advised to avoid certain fish for fear of this poisoning. It is such a shame that we can’t trust our food supply. It is also a shame that Piven has to suffer through the stress of having to defend himself on top of the effects of the poisoning. I hope Piven will make something good come out of all of this and use his clout and celebrity to get our government to crack down on those poisoning our waters. Finally, all of this should serve a reminder to all of us (including myself): practice moderation; no good can come from eating one thing in excess every day. Should I Go to D.C. for the Inauguration? I was too chicken to go to Grant Park on Election night. It would have been so much easier than what I am contemplating now, going to D.C. for the Inauguration. My applications for tickets were denied. My request to Senator Durbin seemed to be denied the day after I applied. Just a couple of weeks ago, I heard from Jan Schakowsky, my Congressional Rep., who denied my application for tickets as well. In her email notification, she encouraged a ticketless attendance, explaining that the entire National Mall will be open to anyone without a ticket. I would have no problem finding a place to stay, I have many relatives and some friends who have already expressed their willingness to put me up. I would have to get Gadget Man to agree to take off work to watch the children. I have already planted the bug in his head, but he didn’t seem very enthusiastic. The biggest problem I have is that I’m a bit squeamish around large crowds. The last time I was around a very large crowd (Stevie Wonder in Grant Park) I had a wonderful time once I found a place to put my lawn chair. However, walking in such a large crowd to enter and to exit the park, I nearly had a panic attack. There were people shoulder to shoulder on all sides of me and I was totally paranoid that one of those deadly stampedes could break out at any time. Another problem I have is trying to figure out why I am so drawn to the idea of going. Is it just for bragging rights, so I can say, “I was there.” Wouldn’t I be able to see more and hear more if I watched it on television in the comfort of my own home? Chances are, I’d be watching it on a big screen out there anyway. But something is calling me. Perhaps it is a desire to be a part of something bigger than myself. To witness history, not just through my own eyes, but through the eyes of those who are just as willing to brave the crowds and the cold to be part of it all too?